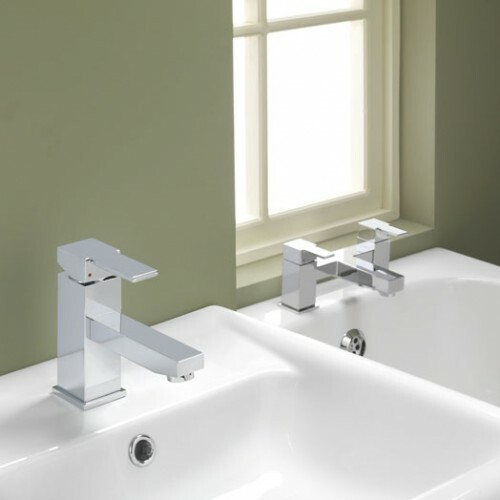 Roper Rhodes Hydra bathroom taps are a brand new edition to their collections, it is simply a really well priced designer range of taps and mixers. What I like apart from the price is the design, its wide waterfall styled spout and handle that follows perfectly, it has a squared body and all the great function of all the other Roper Rhodes ranges like a built in temperature and flow limiter that can be adjusted to suit the installation. 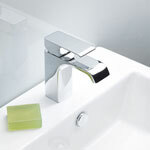 Hydra is not a huge range but covers the minimum requirement, in the collection is the Hydra mini mono basin mixer and the Hydra basin mixer in the picture to the right, the Hydra bath filler and the Hydra bath shower mixer which comes complete with a contemporary square shower handset and hose. If you want to see the entire range at the best prices then click here. 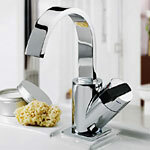 For the best prices on Bristan bathroom taps and showers visit the new dedicated Bristan website launched this week. where you can get a price match promise . 30 day money back guarantee and all products will be with you in two – three days… really worth a look. This beautiful website has the ranges laid out in front of you with all the best sellers there to see, whether you are looking for Java, Chill or Prism bathroom taps or showers you might even like the traditional values of the 1901 taps and showers. All products come with a five year guarantee. To see the new website click here. Bristan have now launched there new look Artisan Showers, they have been styled to match todays minimalist living with clean lines and following in the tradition of Bristans value for money products they have come up with a winner. Aluminium bathroom cabinets from Germany have been leading the way for many a year when it comes to durable designs, wooden bathroom cabinets have many failings they do not last, yes you can get colour choices, yes they are cheap, there are many styles too choose from but with a flood of cheap imports and there lack of durability in a wet enviroments there days are numbered. Aluminum bathroom cabinets have traditionally been expensive to buy but the tide is turning, the first manufacturer to arrive on our shores was Schnider with a good range of choice and the price tag to match, then tapstore.com launched there range of Aluminum Bathroom cabinets also from Germany and they sensibly used the best selling designs and features from the Schnider ranges and made them affordable, with the high quality chrome corner sections and hinges for durability, aluminum carcass 6mm Glass shelves, Intergeral movable glass shelves and optional lights and shaver socket, Double sided mirrored doors, you have a strong, durable and well priced range. There are many ways to save water and in todays energy efficient climate we need to save water but without loosing the function and design. In the early days of water saving devices we had products such as dual powered immersion heaters which used to switch between sink and bath as differing power options. sink would only heat a small volume of water so you saved on electricity, bath would heat the whole cylinder.